Shailesh introduces now premium and state of the art metal forming machinery both for capital good and consumer durable industries. are now gaining popularity due to rapid developments in automobile and consumable durable sectors. The rigid DOUBLE SIDED frame in four-piece be rod bolted or single piece construction is made from extra thick high tensile steel plates. Plates are beveled on all abutment edges to produce full penetration welds. Heavy cross members are welded to further resist deflection and frame stretching. The frame elements are thermally stress relieved for maintaining accuracy over long periods of use. The heavy-duty STEEL PLATE FABRICATED slide has extra long Phosphorous Bronze guideways and has eight (8) point gibbing. Slide adjustment is effected through worm and worm wheel arrangement and is motorized. Multiple knocks put bar arrangement is built into the slide. The crankshaft is forged and turned from CHROME MOLYBDENUM steel and is ground all over and run in large dimensioned bronze bearings. The crank is in shape, dimensions, and radii so maintained as to eliminate stress concentration and metal fatigue and is ultrasonically tested. Single and double reduction gears are offered with single and twin drive options. A heavy duty dynamically balanced single disc combined clutch and brake unit is used to avoid overlapping functions and to reduce noise. The high torque combination unit results in high-speed actuation, small braking angles, and quick heat dissipation. Are simple and safe; meeting IBS specifications and giving are of operation, they provide complete operator and machine safety. 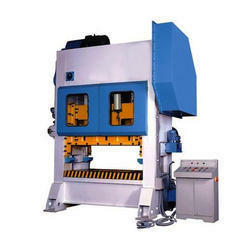 "Kawa" introduces super rigid series presses in C frame construction for heavy duty production work incorporating such standard and optional features to make them unique production machines, like automatic Centralised lubrication; hydraulic overload devices electronic operator safety devices, pneumatic die cushion; six point guiding systems; stroke counters; die lifting devices; single tool die holder etc. 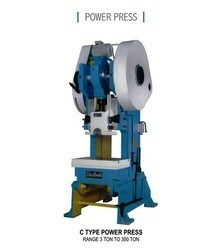 Presses are available from 10 tons to 250 ton capacity. Special executions are also possible to meet individual production requirements. Consists of two or several members assembled by tie bars made of special steel and shrunk in position. The crankshaft is forged from special Alloy Steel. Its shape dimensions and wide radii eliminate stress concentrations and metal fatigue and run in two Bronze Bearing which is well lubricated from the centralized system. Heavy Duty low inertia single, multi-disc clutch, brake unit is used for transmitting power to the machine. Wear adjustment is automatically compensated by little additional movements inbuilt in the air cylinder. Slides are counterbalanced by pneumatic cylinders to eliminate any possibility of its running ahead of specified speed and also to contract possibility of rebound due to the bottom ejector. All presses are equipped with pneumatically operated safety controls with provision of inching, single and continuous strokes control. 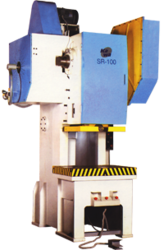 "Shailesh" introduces state of the art Cross shaft presses having 10 tons to 250 tons capacity having rigid frame construction incorporating several std/optional features for optimum productivity like pneumatic clutch, brake unit, pneumatic die cushion, stroke counters, hydraulic overload safety device, electronic operator safety device hydraulic tool clamping systems, quick die unloading systems, Centralised automatic lubrication etc. 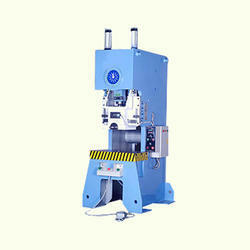 Press automation can also be done with the installation of de-coilers, straightness, feeders, choppers etc. Special executions are also possible to meet individual production requirements. Minimum frame gapping, low, angular deflection. High rigidity frame and bolster. High precision forming for longer die life. Hi-Torque pneumatically operated single disk combined clutch and brake unit. Gear transmission runs in an oil bath. Wide slide and bolster area. Highly rigid frame & wide point spacing The highly rigid frame, slide & bolster hold the frame gap opening, frame elongation & bed deflection to the absolute minimum. The wide point spacing enables the presses to withstand eccentric loads. The highly rigid frame of the press is designed to ensure that there is a minimum level of angular deflection under stamping load - frame deflection & elongation. The thick bolster minimizes deflection which results in providing a sufficient margin for operations that require high accuracy. 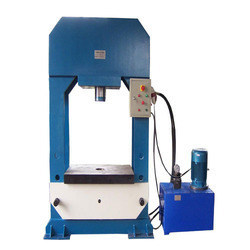 Pneumatic counterbalancers are provided to counter the weight of the slide and toolings, which help in taking up the bearing clearances and ease side adjustment, as well as the smooth movement of the slide and effective braking. The structure is bilaterally symmetrical and the six-face guideway provides full-length support to slide to minimize left to right and front to back movement, as well as the rotational tendency of the slide during operations resulting in prolonged die life. The mechanism that ensures high precision. The high-quality power shaft is employed to give outstanding torsional rigidity. Long 6 point gibs, ensure that accuracy is maintained for a very long time. Die life is also. On the KAWA low clearance is achieved by accurately machined torque transmitting parts, particularly the joints, connecting crank, connecting rod, ram screw, and slide. 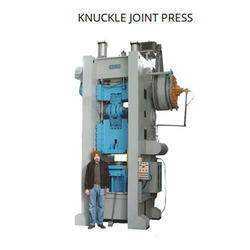 The overall clearance is less than half of conventional presses which reduces break through and other stresses associated with punching. All these results in - Substantially prolonged die life. - Noise level is reduced to a minimum - the High accuracy of points and torque-transmitting portions are easily maintained improving the durability of the press. With the aid of our skilled engineers, we are able to offer a wide range of Press Line Automation to our clients across the national as well as international market. 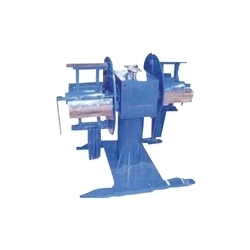 The raw material used to fabricate these automation presses is of optimum quality, procured from the reliable sources of the market. 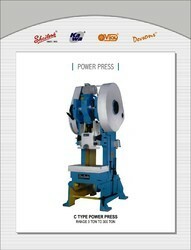 Acknowledged for its long service life and sturdy construction, we offer these presses at industry leading prices.